Nickelsville Moving Again; Agency to Close? Nickelsville is likely to move again, after a vote by University Congregational United Church of Christ (UCUCC) to allow the homeless encampment use of their parking lot at 45th and 15th for the next three months. 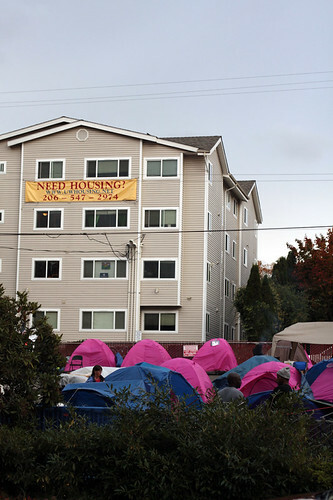 (#) This will be the fifth move for Nickelsville since September- they began near the Duwamish River, moved to a parking lot nearby, camped out at Discovery Park, and finally settled in the U-District at the University Christian Church (UCC). UCC needs to use its parking lot again- not surprising considering that UCUCC says that their parking lot would have earned them about $19,000 in the three months that they’ve allotted to Nickelsville. Fortunately for residents, the distance between the two camps is only five blocks, and will likely make logistics and transportation during the move a little easier for the residents. And there soon may be more residents at the tent city. A local homeless shelter that provides 55 beds to homeless men may be out of funding, barring a Christmas miracle, according to the P-I. (#) CityTeam Ministries (formerly Peniel Missions, a 106-year-old ministry), will close on December 27th, unless they are able to raise $1 million by Dec. 4 to cover their $742,000 annual operating expenses for next year, as well as outstanding expenses from this year. If you’re interested in donating, you can read their director’s letter. Posted in Uncategorized | Comments Off on Nickelsville Moving Again; Agency to Close? 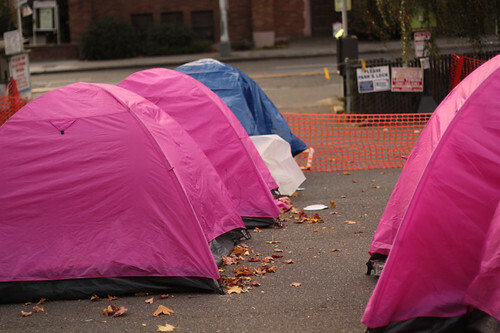 Nickelsville, the tent city made up of homeless people, moved once more over the weekend to a parking lot owned by University Christian Church in the U-District, where residents hope they’ll be able to remain until year’s end. Inside the encampment, residents, advocates and organizers gather and scatter, taking care of various tasks. Each resident has to contribute to the running of the camp, doing chores or working a security detail, according to one resident, Kailli. “All people need is a chance… it makes a difference feeling like you’re part of something,” explained Aaron Colyer, a resident and unofficial spokesman for Nickelsville residents. Colyer himself was busy sorting food donations, cooking, and stabilizing the pavilion being used as a kitchen by the residents as he spoke about the programs offered at Nickelsville. Every Monday night, the residents have a Bible study, and organizers are working on setting up an AA meeting specifically for Nickelsville residents. Some social service programs have come on site to offer assistance, something Colyer says seems like a wise idea- he believes it would save the city time and money by not sending the homeless to services located in different areas of the city, but instead bringing the services to a large group of homeless. Nickelsville had only 42 residents earlier this month, and is now up to 65. Colyer believes they will hit 100 in their current location, and he would prefer it if they could set up a permanent encampment large enough for 1,000. Currently over 2,600 people sleep on the streets every night, according to figures from the One Night Count. Those numbers are up 15 percent from last year, and are unlikely to get smaller given the current economic situation. Many shelters only allow men or women, and there are very few shelters that allow families to stay together. Even when those shelters are found, Colyer says, many families will only stay for a few nights, rather than dealing with Child Protective Services. Additionally, the hours some shelters keep disallow residents from getting night-shift jobs. The camp can still use tents, wooden pallets to put the tents on top of to keep the rain from soaking underneath them, blankets, clothing- particularly men’s clothing, sleeping bags and food donations are always accepted. Colyer said Big Five, the sporting goods store in the U-District would give a discount to those purchasing items for Nickelsville, but that has not been made official yet, so potential buyers may want to verify that information.